Procrastination is refusing to do what you should do now, which you could do, to be done at the later time or date in the future. Having struggled so much with procrastination myself, at a point, I made up my mind to overcome it. And I did. This brought me so much INNER JOY and my productivity level increased geometrically. It was this INNER JOY of overcoming it [Procrastination] that made me to document how I did it for those who might also have been struggling with it too. If this works for me, it can work for you too. But daily, I still and must still, keep all these principles that helped me to keep procrastination under check. Procrastination is a Time and Opportunities of life waster. You must do all you could to overcome it if you want to excel in life. 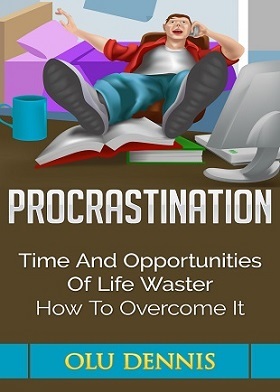 In this book, I highlighted how you can recognize procrastination in your life if it does exist there, its consequences and how to overcome it.